Arugula is an underrated “super green”, in my opinion. It took me a while to warm up to its bitter and almost peppery taste, but now I consume it regularly and love making arugula green smoothies. What’s so special about this cruciferous vegetable also known as salad or garden rocket? Here are a few of the top health benefits attributed to arugula. Arugula is high in vitamins A and C, which are potent antioxidants and boost the immune system. Vitamin K, which is good for the brain and helps the body absorb calcium, thus promoting bone health. And the B vitamins, especially folate, the natural source of folic acid. Like all cruciferous vegetables, the phytochemicals in arugula help prevent many types of cancer. High in the minerals magnesium, iron, and copper, all essential for good health. Arugula is a good source of chlorophyll, which helps protect against liver and DNA damage from aflatoxins, substances found in corn and nuts. A good source of dietary fiber that aids in proper digestion and elimination. Some people even consider arugula a superfood – see for yourself. 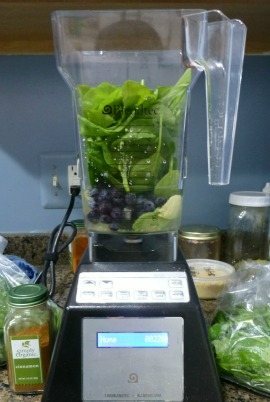 This recipe calls for 1/2 cup of arugula and 1/2 cup of spinach for a good variety of nutrients and to avoid an overly bitter tasting smoothie. Since this smoothie doesn’t call for a sweet fruit (you could use a banana instead of avocado though) make sure to use enough sweetener. In case you’re keeping track at home, I added a green superfood powder (Boku) and a chocolate protein powder (Sun Warrior) to my version of this smoothie. Enjoy! I’d love to know if you tried and enjoyed this avocado arugula green smoothie – please do tell in the comments below. Happy Blending!